The collection transferred to the University Archives in February 1998 from the Office of Student Life Activities and Facilities. In 1893, the University of Pennsylvania Trustees decided to provide a facility for the social and recreational use of students. Trustee (later Provost) Charles C. Harrison announced a contest for its design, which was won by two students, William C. Hays and M. B. Medary, Jr. To finance the project, Harrison succeeded in securing a donation of $100,000 from the Trustee Henry Howard Houston and his wife Sallie S. Houston. Strong supporters of extracurricular activities in college life, the Houstons gave the gift in memory of their son, Henry Howard Houston, Jr., Class of 1878, who died in Rome in the spring of 1879. The Hall was dedicated in January 1896 to house the first student union in the United States. It has since been an important site on campus for social, recreational, educational and cultural activities involving and open to not only students, but faculty, staff, alumni and University guests. In January, 1996, the University community marked the centennial of the Hall and combined it with the annual celebration of the birthday of Benjamin Franklin, the University Founder’s Day. 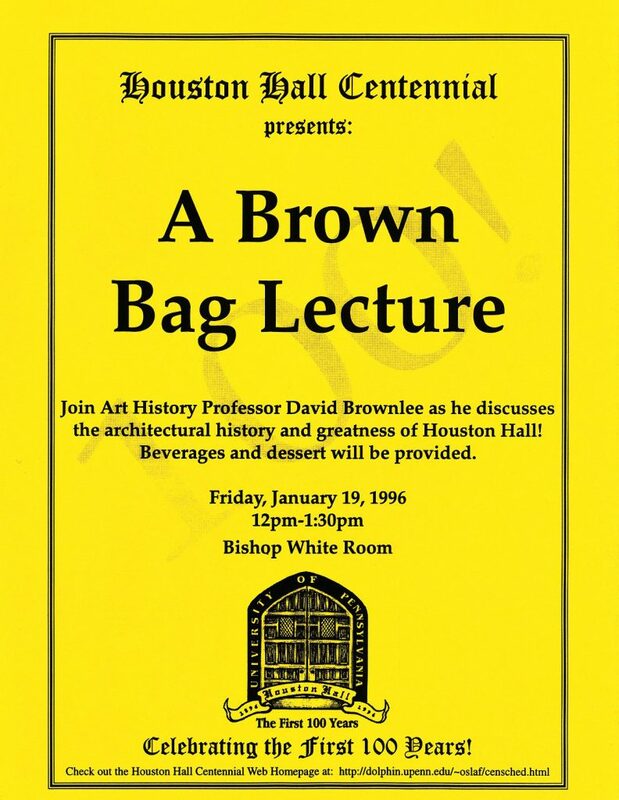 The Hall hosted a series of events, including an opening reception, brown bag lunch lectures, House Party, a jazz concert, Tea Party, and exhibits on the development of the Hall and the University. The collection consists of two parts, miscellaneous memorabilia related to the centennial celebration including flyers, posters, booklets, and a program, as well as hundreds of photos of various events held on the occasion.